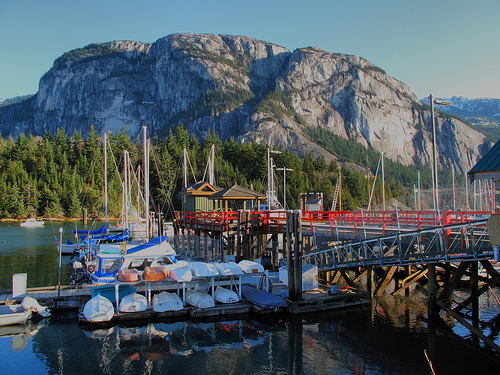 Conveniently located halfway between the 2010 Olympic Winter Games host cities of Vancouver and Whistler, Squamish (pop. 16,000) justifiably bills itself as “The Outdoor Recreation Capital of Canada.” Its active, nature-loving citizens invite visitors to join them in rock climbing, river rafting, bird watching, cross-country skiing, and other signature outdoor activities. Local provincial parks, rivers, and the sparkling waters of Howe Sound invite exploration. In addition, discover this oceanfront, mountainside community’s rich railway, mining, and forestry history.